20 people in the US are battered EVERY MINUTE. And EVERY DAY, 3 women are killed by their intimate partners. According to 2017 U.S. Census Bureau, out of 12 million single-parent families with dependent children, more than 80% were headed by single mothers. The poverty rate for female-headed families with children was 87 percent higher than that of male-headed families with children. Almost 1 in 4 (22%) children in Texas live in poverty. These children are 5 times more likely to die from an infectious disease and have increased risk for low birth rates, which compromises cognitive development. 1 in 4 (25%) children in the US are exposed to some form of family violence in their childhood. The likelihood that these children will become a victim or perpetrator of domestic violence in adulthood is doubled. This is the single greatest indicator that a person will later abuse or be abused. Human trafficking is the third largest criminal industry in the world, a $150 billion industry, with 24.9 million people in forced labor, sexual exploitation and domestic servitude worldwide. Statistically, human trafficking victims live only another 2 to 7 years once they are trafficked. Research suggests that 99% of these victims are NEVER rescued. And truly, this list could go on and on—which is the “why” behind Magdalena House. Founder Reverend Denise Barker saw the faces behind statistics like these and simply could not turn a blind eye. Instead, out of an incredible compassion and a “drive to serve San Antonio’s most vulnerable” and “to participate in the holy work of wholeness and transformation,” Denise, along with Dr. Kay Rodgers and countless volunteers and support fromUniversity United Methodist Church, founded Magdalena House almost twelve years ago. HOME—Families live in a beautiful, safe and nurturing neighborhood of transitional homes near the Medical Center while they put their lives back together. HELP—An individual program of supportive services is created for each mother and child that focuses on educational and vocational assistance, life enrichmentclasses, spiritual formation, a loving community and outsourcing to other agencies to meet the full gamut of a family’s needs. HOPE—A process that works towards self-awareness and achievement of personal goals in education, vocation, parenting, household management, and spiritual formation. Magdalena House strives for radical hospitality and an authentic family environment. Gloria was the victim of terrible, violent abuse at the hand of her husband. She tolerated that abuse out of fear and intimidation, and to protect her children from becoming victims as well. With tremendous courage and the help of others that she trusted, she escaped her husband’s wrath and got her children and herself to the safety of Magdalena House. There she found community—staff, volunteers and other residents form an intangible bond. They love, encourage, support and hold each other accountable using “Covenants,” goals to be achieved, promises to keep, that are created each school semester by each mother. Gloria has now graduated from Magdalena House with a degree in nursing. She now serves at a low-income, adult day-care center. She has her own apartment and is entirely self-sufficient. Gloria’s children now see a mother who is confident, strong, and willing to fight for their wellness. Gloria and her children have beaten the odds. Due to her parents’ drug addiction, Miranda had been the primary provider for her siblings since the age of six. When she was finally removed from that awful situation, she lived in eight foster homes. Told by high school advisors that college was out of the question, she was put in Special Education classes and floundered there until she aged out of foster care. Ultimately, she came to live at Magdalena House with her young children, where she found the support necessary to finish her education and find her voice. She has received her State Certificate in Community Health and is a registered Promatura. Upon graduation from the Magdalena House she worked for 5 years in the social services field as a case manager. She is now a full-time case manager at Magdalena House, providing inspiration and a unique perspective to the women they serve. She has become a powerful voice for women, a true advocate, and has been asked to speak at numerous events as an inspiration to others. Miranda has beaten the odds. Luca was a victim of human trafficking. Most likely trafficked by a family member, she was taken from her home in El Salvador, told that she had a work Visa and that the man loved her and wanted to marry her. Once in Texas, she realized all too quickly that she had been brought there for the pleasure of the man and his wife. She was confined to their home, unable to leave or reach out for help. Finally she was able to escape one day and immediately contacted authorities. With the help of the South Texas Anti-Trafficking Coalition, Bexar County Sheriff’s department and Catholic Charities, she found her way to Magdalena House and began the long road back to self-respect and self-preservation. With the support of all of the programs offered through Magdalena House, and with a tremendous amount of focus, Luca learned to speak English well and applied for and received her T Visa and work card. After graduation from Magdalena House she moved to Florida and began work at a Christmas Tree Farm. Tragically, Luca had left behind her 6 year-old-son in El Salvador on the promise that he would be brought to Texas once she was established there. After Luca toiled for two years to improve her life and provide an opportunity for her son here in the states, an Emmaus Reunion group flew Lucaand her son to Houston for “a heavenly reunion.” She wanted him to fly to Texas first because she wanted him to “see the people who changed her life, and now his, forever.” She now manages the office of a BMW dealership. She and her son live self-sufficiently in Florida where he will attend college classes in the fall. When Luca came to Magdalena House she hated God and couldn’t bring herself to believe in a God that would allow this to happen to her. She learned that God is good and that she is beloved while being surrounded with love and care at Magdalena House. She now is a church planter in an evangelical church in Florida—and praises God daily! Luca and her son have beaten the odds. Magdalena House has an extraordinary mission, and is literally, changing lives daily. Their unique approach to aiding families, with the centerpieces of academic and relational programming, means that Magdalena House is in high demand. 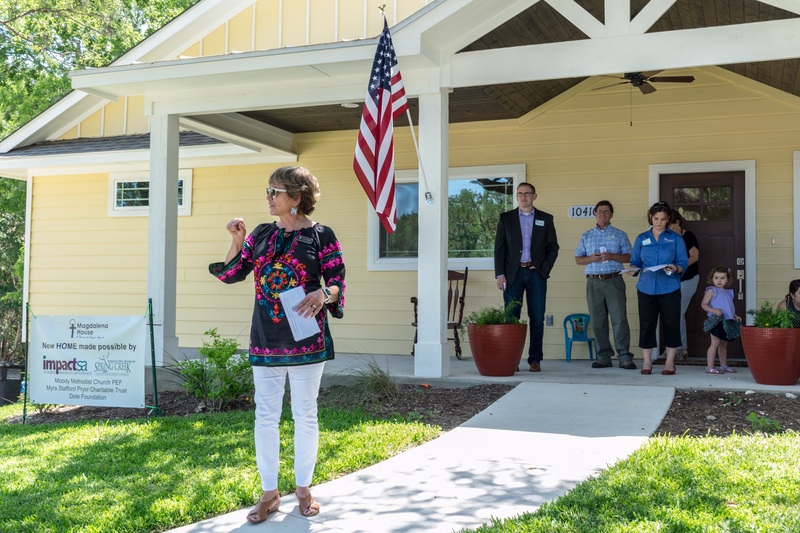 This spring, the dream to grow Magdalena House into a neighborhood with multiple houses on the same tract of land came to fruition with two more homes and a Family Wellness Center opening, and thus the HOPE of serving more families in dire need has become a reality. To continue the good work of Magdalena House, an Evening of Hope Gala will be on September 29, 2018, and all proceeds will go to further their mission. For more information about Magdalena House, please visit MagHouse.Org.